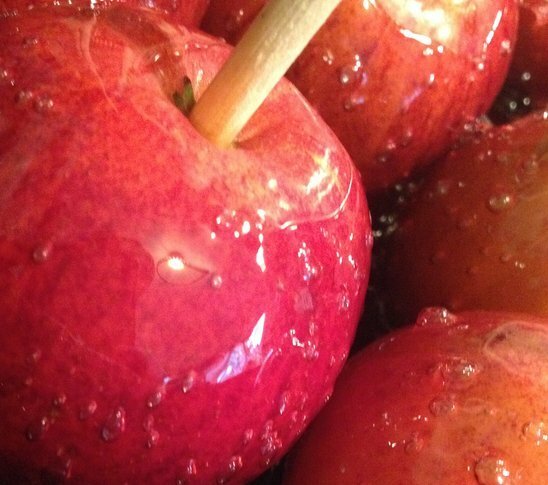 It just wouldn’t be Halloween and Bonfire Night without a few toffee apples to munch on… A real easy family recipe. First give the apples a good wash and then rub them dry. Then put the lollipop sticks into them - I do this by tapping them in using a rolling pin as a ‘hammer’. Grease an old roasting tin with the olive oil. In a saucepan over a low heat put 100ml water, caster sugar, syrup, vinegar and food colouring and warm gently until the sugar has dissolved - stir the whole time using a metal spoon. Once the sugar has dissolved stop stirring and bring the toffee mixture to the boil - be careful here that you don’t let it over boil. Allow the mixture to boil for around 5 minutes and then start to test the toffee. Do this by scooping out a teaspoonful and dropping it into the jug of cold water. When the toffee is ready it will form a hard snappable piece of toffee in the water. If it doesn’t then continue to boil for a few more minutes and then re-test. Once the toffee is ready - take it from the heat and quickly swirl your apples in the toffee to coat them. Work fast here! When they are coated place them on the greased tray and put them in the fridge to set hard. A must have for Halloween and Bonfire parties. Disclaimer – the apples used in this recipe were a selection of English apples from Sainsbury’s and were given to me free of charge. 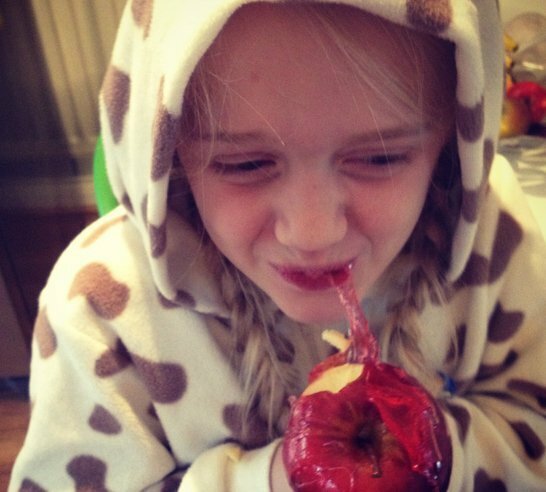 English apples are my favourites and they taste just lovely with or without the toffee!